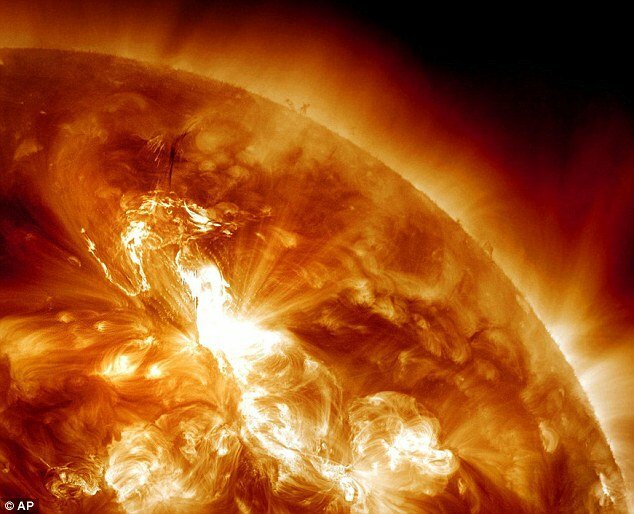 Specialists announce that the sun is today bombarding Earth with radiation from the biggest solar storm in almost seven years, with more to come from the fast-moving eruption. The solar storm occurred at about 11: 00 p.m. Eastern Time on Sunday and will hit Earth with three different effects at three different times. The biggest issue is radiation, which is mostly a concern for satellite disruptions and astronauts in space. It can cause communication problems for polar-travelling aeroplanes, experts said. Radiation from Sunday’s flare arrived at Earth an hour later and will probably continue through until Wednesday, experts say. Levels are considered strong but other storms have been more severe. There are two higher levels of radiation on the National Oceanic and Atmospheric Administration’s storm scale of “severe” and “extreme”, space weather centre physicist Doug Biesecker said. This storm is the strongest for radiation since May 2005. The radiation – in the form of protons – came flying out of the sun at 93 million miles per hour. “The whole volume of space between here and Jupiter is just filled with protons and you just don’t get rid of them like that,” Doug Biesecker said, explaining why the effects will stick around for a couple of days. NASA’s flight surgeons and solar experts examined the solar flare’s expected effects. They decided that the six astronauts on the International Space Station do not have to do anything to protect themselves from the radiation, spokesman Rob Navias said. First comes electromagnetic radiation, followed by radiation in the form of protons. Then, finally the coronal mass ejection – that’s the plasma from the sun itself – hits. Usually that travels at about 1 or 2 million miles per hour, but this storm is particularly speedy and is shooting out at 4 million miles per hour, Doug Biesecker said. Plasma causes much of the noticeable problems on Earth, such as electrical grid outages. In 1989, a solar storm caused a massive blackout in Quebec. It can also pull the northern lights further south. But this coronal mass ejection seems likely to be only moderate, with a chance for becoming strong, Doug Biesecker said. The worst of the storm is likely to go north of Earth. And unlike last October, when a freak solar storm caused auroras to be seen as far south as Alabama, the northern lights aren’t likely to dip too far south this time, Doug Biesecker said. Parts of New England, upstate New York, northern Michigan, Montana and the Pacific Northwest could see an aurora but not until Tuesday evening, he said. For the past several years the sun had been quiet. Part of that was the normal calm part of the sun’s 11-year cycle of activity. Last year, scientists started to speculate that the sun was going into an unusually quiet cycle that seems to happen maybe once a century or so. Now that super-quiet cycle doesn’t seem as likely, Doug Biesecker said. Scientists watching the sun with a new NASA satellite launched in 2010 – during the sun’s quiet period – are excited.